Your home keeps you and your family safe. It provides you a secure place where you can live and share your life with your loved ones. It is where you come back to after a hard day’s work. The home that you have today was not easy to get. It took many years and a lot of money to have the home that you are living in today. While we get busy with our lives, we tend to forget that our homes are very much like us – destructible, quite contrary to what we want to believe. One cruel stroke of destiny can destroy the home that you love so much. However, you can protect your home in a simple way with a homeowners insurance. 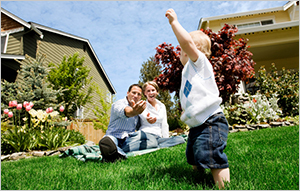 Though it may not bring back your home, your losses can be compensated for adequately. A homeowners insurance policy will help to protect your most important asset from natural disasters such as earthquake, flood, wind storm, hail, lightning, snow and freezing as well as from other accidents such as fire, smoke damage, theft, vandalism, falling objects, plumbing overflow, electrical damages and vehicle damages. Actual Cash Value Policy: In this kind of insurance, the insurer will be liable to pay you for the entire cost of your property that has been damaged after the depreciation has been calculated. Replacement Cost Policy: This insurance policy will help to pay for the repair work carried on against the damaged property using the same kind of materials that was used in the home prior to the damage. In this kind of insurance, the depreciation is not deducted. A home insurance protects your liability if you, a member of your family or a pet become responsible for any damage or injury to others. Apart from the actual house, the insurance cover other structures such as a gazebo, fences or a detached garage or garden shed. The insurance can cover movable properties such as electronic items, furniture etc including expensive items such as jewelry, paintings, antic items, etc. In case you had guests during the time of the disaster, the policy will pay for the medical expenses of your guests. If the home is uninhabitable, the insurance company will pick up the tab for living expenses that you and your family have to incur. There is no knowing when disaster will strike. As mere mortals, we cannot dictate nature or control her fury. No matter how careful a person is, accidents can and do happen. While we cannot control a disaster, we can take steps to prevent it and control the damage as much as possible. A home owners insurance does just that and therefore is a must for all.